This little quilt was made for a church quilting class. It’s made the same way as my Raw Edge Circle Quilt but with more than one size circle sewn onto the square before cutting them into quarters. This little lady loves the texture of those circle edges. It’s a fast, fun quilt to make and I can’t wait to wash it…except now it has my mind whirling with pillows large and small I want to make with this pattern. So many ideas and too little time! The colors are so deliciously cute! I love it and your little one is so beautiful! I saw you over on the name game. Love your blog. Yours was one of the first I discovered when I started blogging. 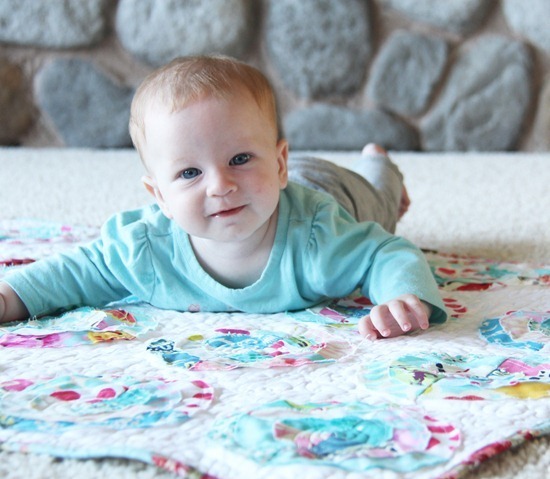 Really cute quilt, but even cuter baby! cute baby! love the quilt too! can you post a picture of it after you wash it? she is just adorable and the quilt is pretty cute too. Thanks SO much for playing the Name Game today! Super cute! Fabulous machine binding…I'm having a hard time catching the back when I try to stitch in the ditch on the front. How do you do it??? 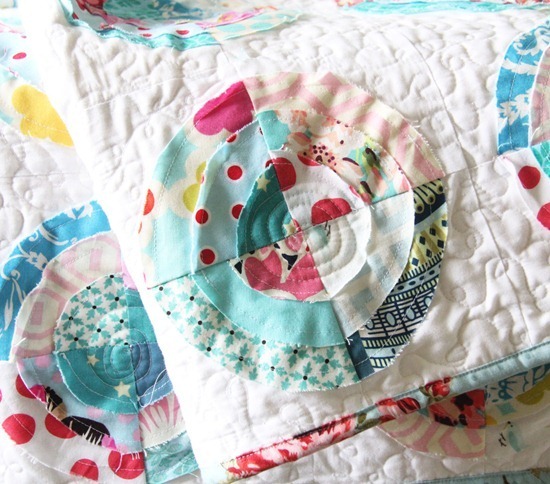 I'm just working on hand quilting a raw edge circles quilt, but now I want to start one of these! It's lovely, and really interesting to see the this design of quilt in a different, lighter more pastel colour way. How do the circle look after washing. Do they hold up over time and use? I love your blog and your quilts, working on the binding for my Amy Butler quilt, hope to post soon. Ack! She's getting so big! She is seriously drop dead adorable. Thanks for sharing that sweet face. Also love the quilt. Well done! Love this!! You choose the prettiest fabrics! It is a fun and happy quilt. I love your colour palette. What a cute little baby girl. I have for long time wanted to sew a bulls-eye quilt, your quilt gave me inspiration. Such a precious and happy little one. 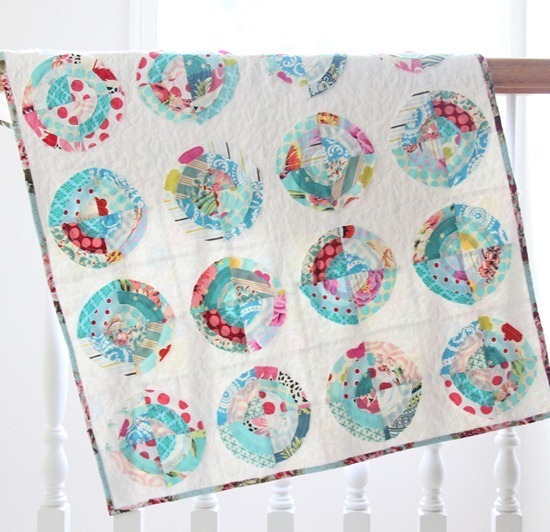 I love your quilt with its bright colors and circular motion! I love this quilt! And yes some pillows would be gorgeous too! Allison, what an adorable baby girl! The quilt colors are so happy too! I made a quilt with this pattern for my first grand-daughter, she loves flowers so I sewed leaves under the circles to make them look like flowers. But I really like this idea so maybe second grand-daughter will get one too! Thanks for the inspiration today. What a great quilt! I love that pattern. I pinned it onto Pinterest, hopefully I collect enough scraps to make one myself. Thanks for sharing! What a lovely tactile quilt. Oh … Your baby is beautiful. Congratulations on your motherhood. The blanket is very nice, but I can only see your baby and smile. I have another baby of 6 months and now I fall for every baby I see. Greetings from Granada, Spain, "Patchwork from the Alpujarra"
She's getting so big!!! Our little are growing too fast. another fantastic quilt and tut! Thank you! Such a fun quilt and the perfect quilt model!